Lithium brine deposits have been generating interest, but what about pegmatite lithium deposits and sedimentary lithium deposits? Learn about them here. As interest in lithium continues to rise, it is useful for investors to gain an understanding of the different lithium deposit types at play. Lithium is mined from three different deposit types: brine deposits, pegmatite deposits and sedimentary deposits. Each comes with different project requirements, extraction methods and processing times. Brine deposits, for example, are the most common, accounting for 66 percent of the world’s lithium resources, but may require longer processing periods. You can read more about them by clicking here. Pegmatite and sedimentary lithium deposits are also important to know about, and the article below outlines their key characteristics. Scroll on to learn more about their importance in the world today. Pegmatite is a coarse-grained intrusive igneous rock formed from crystallized magma below the Earth’s crust. Pegmatite lithium deposits, also known as hard-rock lithium deposits, can contain extractable amounts of a number of elements, including lithium, tin, tantalum and niobium. Lithium in pegmatites is most commonly found in the mineral spodumene, but also may be present in petalite, lepidolite, amblygonite and eucryptite. Australia, the US, Canada, Ireland, Finland and the Democratic Republic of Congo are known to host pegmatite lithium deposits. The top-producing spodumene pegmatite operation, known as the Greenbushes mine, is located in Australia, and it is owned by Talison Lithium. Talison is controlled 49 percent by China’s Tianqi Lithium (SZSE:002466) and 51 percent by Albemarle (NYSE:ALB). Also in Australia is Galaxy Resources’ (ASX:GXY) Mount Cattlin spodumene mine, an open-pit mine that rests on a flat-lying pegmatite ore body. The mine is currently at full production levels. In addition, Galaxy holds the James Bay lithium pegmatite project in Quebec; it is in the feasibility stage. Hard-rock ore containing lithium is extracted at open-pit or underground mines using conventional mining techniques. The ore is then processed and concentrated using a variety of methods prior to direct use or further processing into lithium compounds. Extracting pegmatite lithium from hard-rock ore is expensive, meaning that such deposits are arguably at a disadvantage compared to brine deposits. However, pegmatite lithium deposits have considerably higher lithium concentrations than brines, so deposits with extremely high lithium values may still be economically viable. The production of other metals, such as tin and tantalum, can also help offset costs. It is worth noting that hard-rock deposits are not subject to the sometimes 12-month-long processing times currently seen at some brine deposits. Sedimentary rock deposits account for about 8 percent of known global lithium resources, and are found in clay deposits and lacustrine evaporites. Clay deposits — In clay deposits, lithium is found in the mineral smectite. The most common type of smectite is hectorite, which is rich in both magnesium and lithium. It gets its name from a deposit containing 0.7 percent lithium found in Hector, California. Many companies are in the research and development phases for their clay deposits, but no companies currently produce lithium from them. Lacustrine evaporites — The most commonly known form of lithium-containing lacustrine deposit is found in the Jadar Valley in Serbia, for which the lithium- and boron-bearing element jadarite is named. The Jadar deposit, owned by Rio Tinto (NYSE:RIO,LSE:RIO,ASX:RIO), reportedly contains more than 200 million tonnes of lithium. The company claims it is one of the largest lithium deposits worldwide. Rio Tinto signed a memorandum of understanding with the government of Serbia to fast track the development of the deposit. The project is currently in the prefeasibility stage and could begin construction in 2023 following a final investment decision from Rio Tinto. Now that you know more about sedimentary and pegmatite lithium deposits, what else would you like to know about lithium? Here are some more articles to improve your expertise in the space. Will Lithium Prices Fall by 2021? 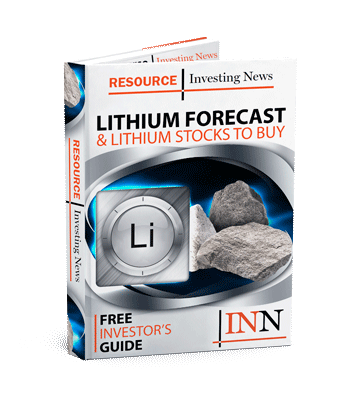 Should Lithium Investors Worry About Oversupply? Can Lithium Producers Keep up With Electric Vehicle Battery Demand? Securities Disclosure: I, Amanda Kay, hold no direct investment interest in any company or commodity mentioned in this article. Wondering if Formation Metals ever starts production and if their shares will reach $ 1.00?